On the 2nd January 2015, residents of Newcastle’s seven drum and bass nights – both old and new – are being brought together by Soundclash to decide once and for all who’s the best selector in town at Newcastle’s Digital. Soundclash, Grenade, Turbulence, Curves, Tundra, Dilate and Mentis will each have 15 minutes to showcase their best tunes, mixed in as quickly and as tightly as possible to the crowd. The judges – Aim from Hospital Records – will hand the winners a shiny new trophy, the final set of the night and some major bragging rights in the coming year. While it’s sure to be a great night, there’s also a more serious side to the event; entry to the club on the night will double up as a donation to the memory of Simon Turner. Simon was a pivotal figure in the North East’s drum and bass scene, working closely with Curves and the Newcastlebeats Show. Last year he tragically passed away after a short battle with cancer. All the donations made on the night will go to Simon’s favourite charities. If you are unable to go on the night but would still like to donate, the organisers have set up a Skiddle page where you can help add to the proceeds. 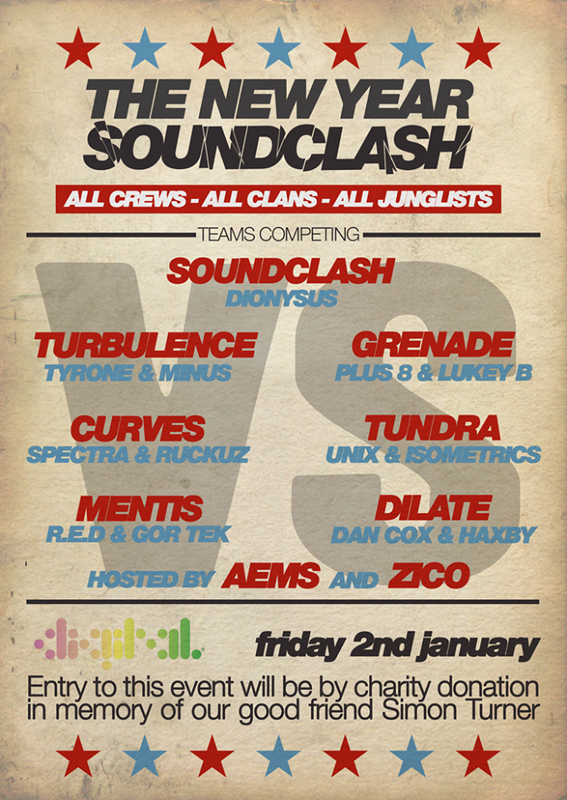 Soundclash’s New Year Soundclash will take place at Digital, Newcastle on Friday 2nd January.